6.05 points at 22 votes (rank 627). Return of the Jedi is the conversion of the Atari arcade machine. This is the final part of the Star Wars trilogy by Domark. It is a shoot'em up or respectively a sidescroller. As also with the arcade machine, this is no game with vector graphics any more but a pixel graphics game. 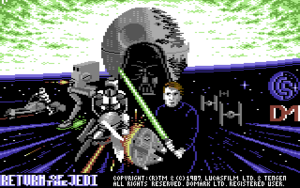 The game offers four different scenes that are based on the happening in the movie (Speederbikes, AT-ST, in front of the Death Star, in the Death Star). Except for the first level, the course of the game is non-linear. After the first level you jump between the scenes to and fro in certain sections. By this it can occassionally happen that you lose a life, because you are suddenly in another scene. Each level has different obstacles that you need to bypass by different actions. The isometric view also differs from scene to scene. In some scenes you need to go to the right while the direction is left in the other scenes. For the game, a single level is a complete wave that consists of at least 2 scenes. After each successful or also not succesful try, the game starts anew and with a higher level. 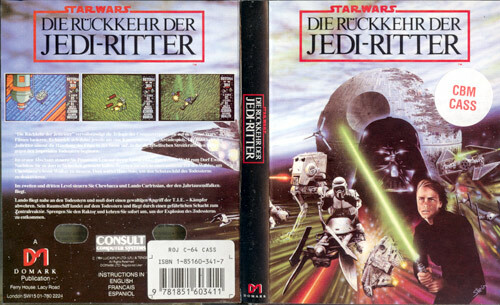 The first level is the Speederbike level. Same as in the movie, you need to get rid of the Scout Troopers that follow on your heels. In contrast to the movie original you also get support from the Ewoks here. However, these small bears themselves can become a real problem, as they make no difference between friend and foe with their traps. You can shake off the Scout Troopers on their Speederbikes by simply kicking them next to the tracks, let them crash into obstacles or shooting them with the gun. However, the obstacles are also dangerous for the player. You often bump against trees, tree stumps and the traps of the Ewoks when making risky manoeuvres. 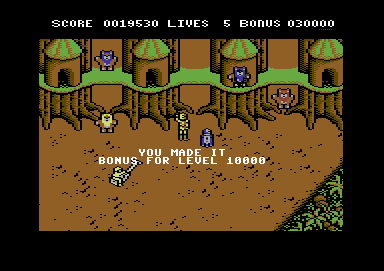 In return, you reach the Ewok village as a reward where you are welcomed as a hero. On the whole this level seems like a racing game. 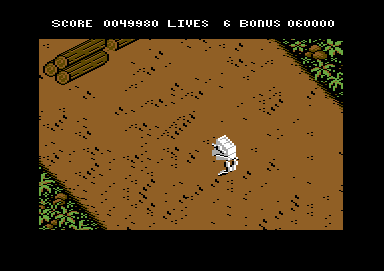 With a hijacked Chickenwalker (AT-ST) you set off to destroy the protective shield of the Death Star. 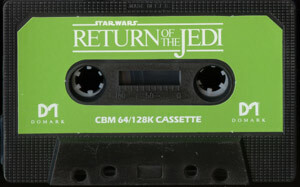 Here you now have the problem that you are seen as an enemy by the Ewoks. They have put up some mean traps on the way to the bunker. On the one hand, these are tree stumps that simply block the way, tree stumps the roll along the way and slingshots. On the other hand, you are also expected by the Imperium, because in the meantime they have noticed that one of their AT-ST was hijacked. The Imperium has put two AT-ST in the way to stop the hijacked Chickenwalker. Now you need to try to skilfully avoid the obstacles. You can also shoot at obstacles, but the AT-ST gun has a very limited reach. As a reward you can watch at the end how the rebells blow up the bunkers. In the Death Star you need to destroy the reactor. You need to skillfully avoid the superstructures inside, which is not so easy as you fly with a relatively wide ship (the Millenium Falcon) through the corridors. 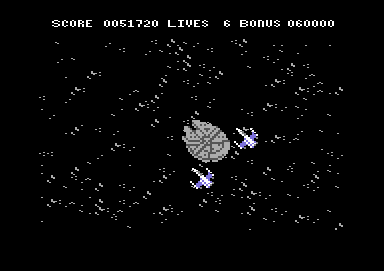 Additionally, the Imperium sends TIE Fighters into the Death Star, which of course are suppoed to stop the player. These cause hardly any harm, but skilful manoeuvres to get rid of the TIE Fighters often end at an obstacle. At the end of a level you need to hit the reactor. Then you are followed by the flames of the explosion. While some pilots try to destroy the Death Star, a fight for the Death Star roars. For this you fly with the Millenium Falcon and two accompanying fighters through the battle and try to hit as many hostile fighters as possible. The graphics go from above-average to below-average and blocky and does not fully correspond to the standard of 1988. The sound is at best mediocre. The game has a title image that is adapted to the movie's poster and with this follows the idea of the forerunners. Between the levels there are partially nice animations. This conversion is not true to original, for this many small details are missing. 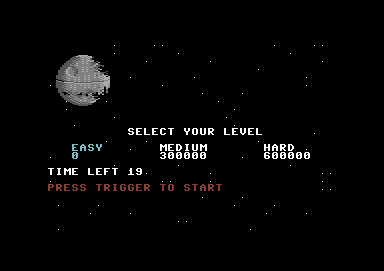 At the beginning of the game you can set the level (1-3-5) by moving the Death Star. The bonus points depend on the selected level. Beginners are advised to start with level 1. 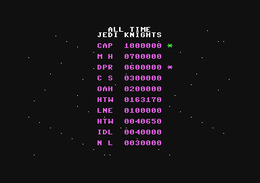 The joystick in port 1 is used. 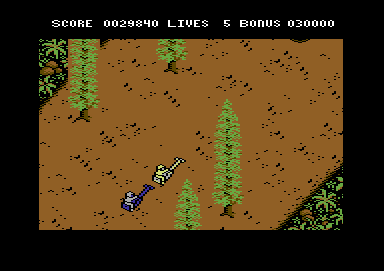 The vehicle (Speederbike, AT-ST, spaceship) follows the joystick movements in the corresponding flying / walking direction (i.e. offset by 45°). The fire button triggers a shot, but it is not coercibly needed in every scene. You can also end some scenes without shooting. Maximum of 3 letters. Unfortunately, the list is not saved. Do not let yourself get followed by an enemy for too long, after some time he will get a hit. You need to fly into Endor Forest before your enemies, so you can better avoid the Ewok traps. In General, it is better to stay in the middle of the screen, so you can manoeuvre more easily. Spaceball: "This title is rather good-looking. Nothing extraordinary, but a nice game. I has a bit of diversification, but you are not fascinated for more than 30 minutes by this title." TheKills: "No real tension arises here, even with the rather good graphics. It is fun, but you do not get the incentive to play it again and again." 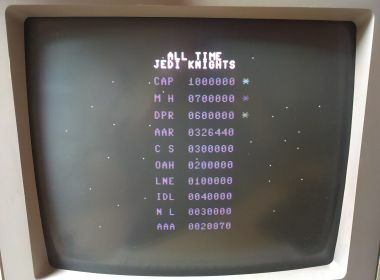 Return of the Jedi in the Killer List Of Videogames. This page was last modified on 19 July 2015, at 12:42.